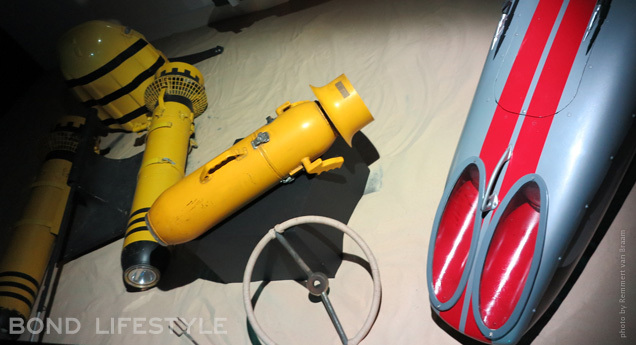 Bond In Motion, the largest official collection of original James Bond vehicles, is now for the first time on display in London. 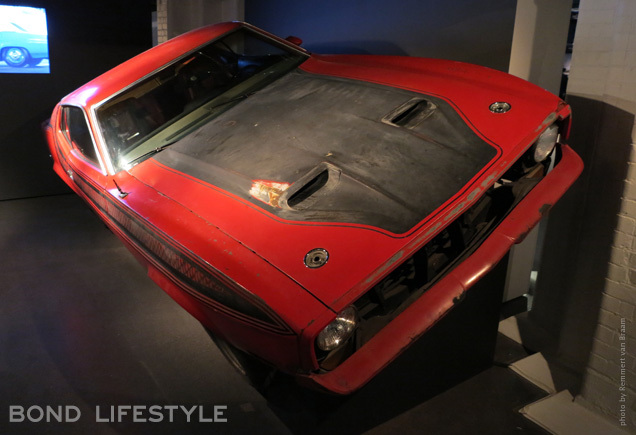 The extensive exhibition, previously located at the National Motor Museum in Beaulieu, is totally at home at its new digs: the London Film Museum at Covent Garden. The museum will open its doors to the public on Friday March 21st 2014 and will stay open throughout 2014 and maybe longer. 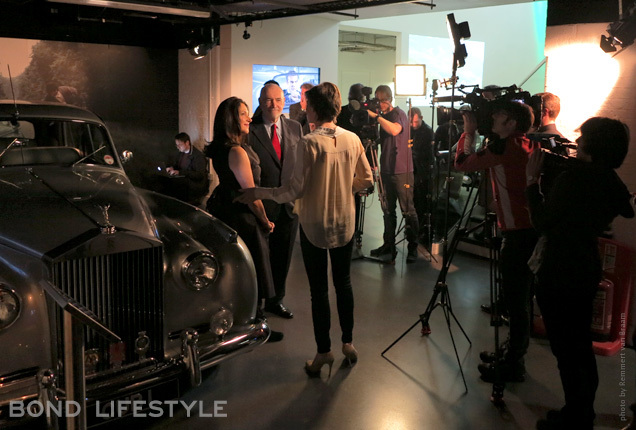 Bond Lifestyle got a chance to preview the exhibition during a star studded press event at the museum on Tuesday March 18th. On this day, the world press could meet not only the vehicles, but also some of the talented people that worked on the Bond films including stunt driver Ben Collins (Quantum of Solace and SkyFall), production designer Sir Ken Adams, production designer Dennis Gassner, stunt coordinator and action unit director Vic Armstrong, art director and production designer Peter Lamont, special effects coordinator Chris Corbould, stunt woman Wendy Leech, screenwriters Neal Purvis and Robert Wade, Bond producers Barbara Broccoli and Michael G. Wilson, EON archivist Meg Simmonds. 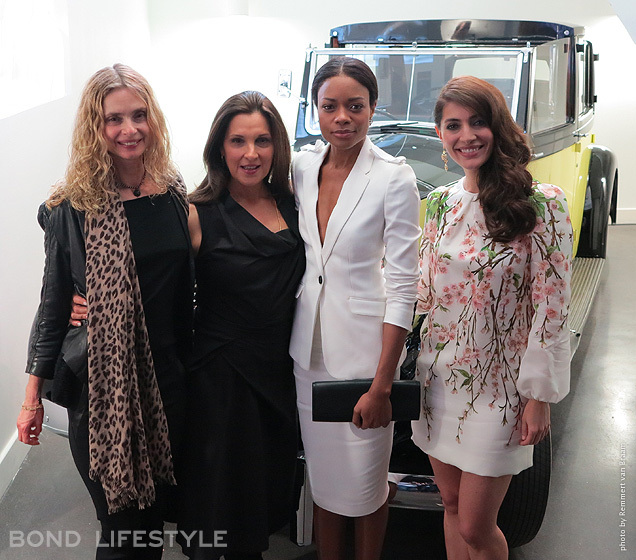 Adding to the glamour were the beautiful Bond girls Caterina Murino (Solange in Casino Royale), Naomie Harris (Eve Moneypenny in SkyFall) and Maryam D’Abo (Kara in The Living Daylights). 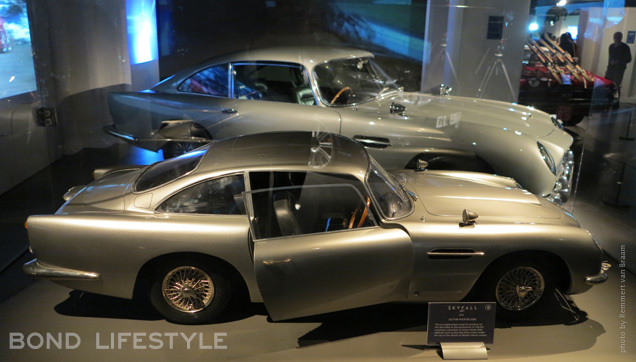 Wondering around Bond’s transportation history, one wonders how Jonathan Sands (founder of the museum) and his team got the vehicles in the rooms. The low ceilings and pillars, part of what used to be the flower market basement, are not exactly spacious, but do create a wonderfully intimate atmosphere. Jonathan explains each vehicle was lowered via the main hall and stairs entrance, which, if you see it in real life, was quite a feat. The vehicles in the museum are accompanied by wall sized posters or video projections, showing the scene in which the vehicle is featured. 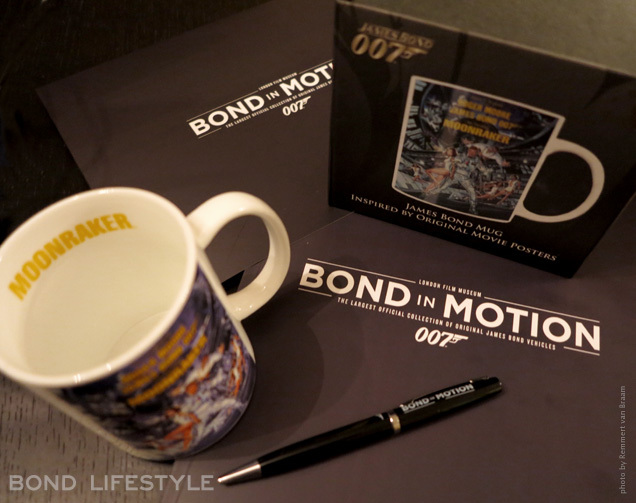 The photos and videos are well chosen and add a lot to the Bond atmosphere. Another great thing about the exhibition is that you as a visitor can get really close to the vehicles, so you can marvel at the details of each machine. Of course there are many museum guards to make sure nobody accidentally sets off a rocket or makes a Vanquish invisible. The famous Aston Martin DB5, like a true star of the show, is a little more protected from the fans by a low fence. 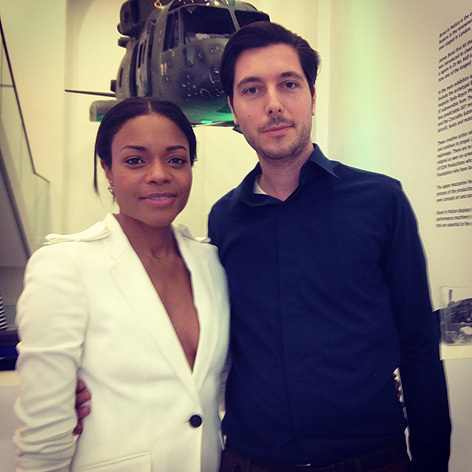 Jonathan explains that he and other designers of the exhibition did everything to enhance the show's experience, including going around on their knees to see it from a child’s perspective, making sure even the little ones can enjoy the models on display. 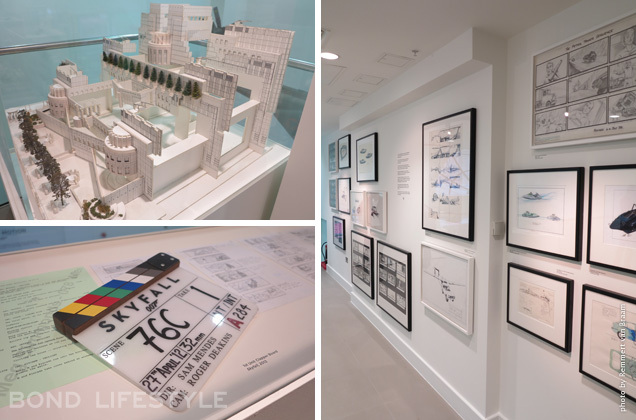 The tour starts on an open elevated floor with a select and very nice collection of production design sketches, including not yet exhibited concept sketches by Ken Adam of Drax vehicles and the Q craft and glider. 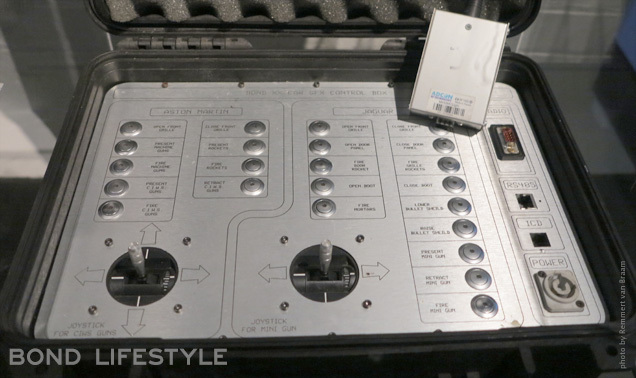 An audio guide is available at the museum's entrance, narrated Ben Collins, which gives background info in each room, in addition to the signs and information boards. 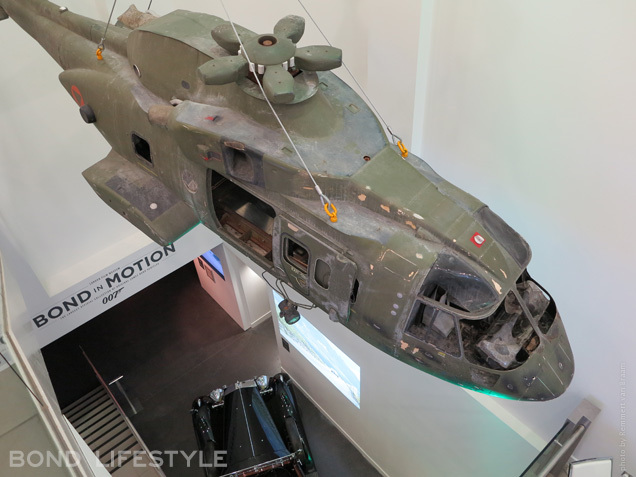 On the stairs leading to and from the concept art floor, you can have a proper look at the impressive 1/3 scale model of the AgustaWestland AW101 helicopter used in SkyFall. This model has never been exhibited before and is extremely detailed for its enormous size. 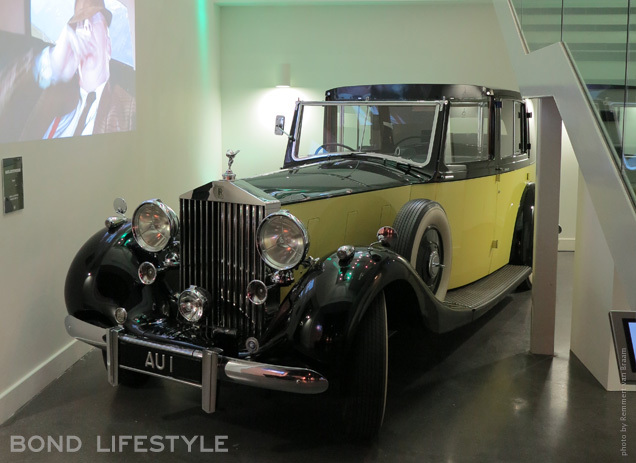 The helicopter is hovering high above one of the most famous cars in cinematic history: the yellow and black Rolls-Royce Phantom III from Goldfinger. "AU1" is standing majestically, although a bit tight, next to the stairs leading down to the main floor of the exhibition, below ground level. Its huge headlights look out over that other famous Bond Rolls: the Rolls-Royce Silver Cloud II ‘CUB 1’ owned by producer Albert ‘Cubby’ Broccoli himself and featured prominently in A View To A Kill. 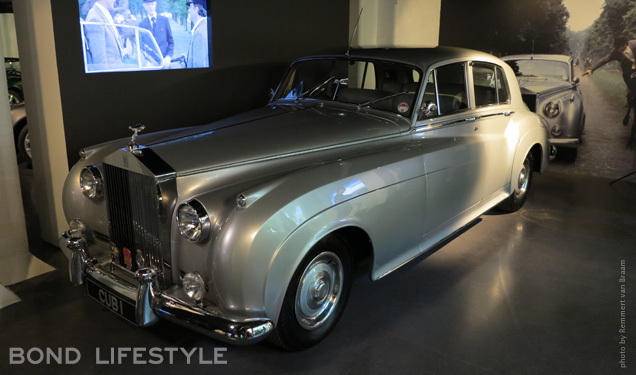 Albert 'Cubby' Broccoli's Rolls-Royce Silver Cloud II "CUB 1"
From there, the exhibition rooms open up with one amazing Bond vehicle after another. 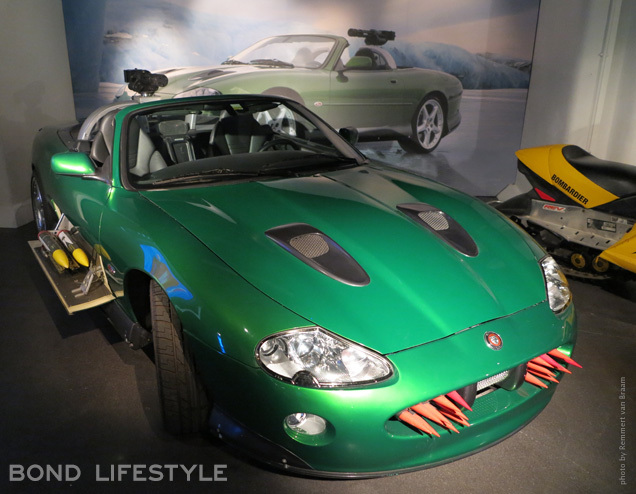 The Die Another Day Aston Martin Vanquish is flanked by the Ski-Doo snow mobile and its opponent, the Jaguar XK8. I won't give away all the vehicles that are present at the exhibition, as you should go see it for yourself, but among the many highlights are Ken Wallis' Little Nellie, the Aston Martin V8 and cello case from The Living Daylights, the switch-blade glider from Die Another Day, a BMW Z8 from TWINE, the Mustang from Diamonds Are Forever, the red and white Glastron GT150 from Live And Let Die and the Bath-o-Sub used by Blofeld to escape in Diamonds Are Forever. The exhibition not only features the full size vehicles, but also a large selection of scale models used for special effects or other shots. These fantastically crafted models, at least as interesting as the real cars, are safely stored in glass display cases. 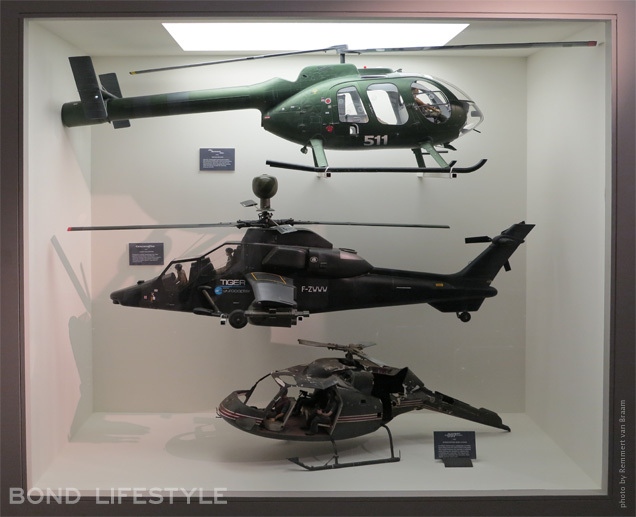 Models include a 3D printed DB5 from SkyFall, a Ferrari F355 GTS and Lamborghini Diablo from Die Another Day, BMW Z8 and chainsaw helicopter from The World Is Not Enough and Tiger Helicopter from GoldenEye. 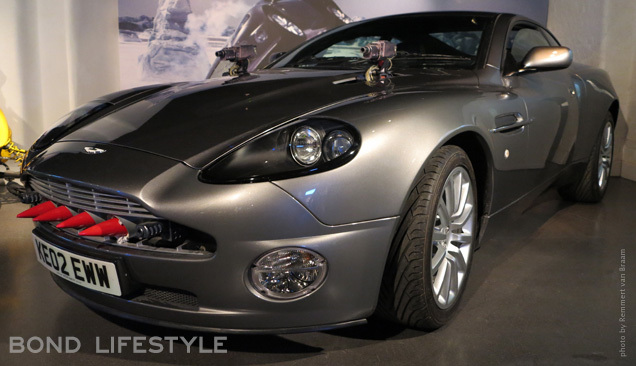 Another unique item at Bond In Motion London is a remote control for the Jaguar XK as well as the Aston Martin Vanquish in Die Another Day. The machine looks like it could have been in a Bond film itself, but was used to activate certain gadgets and effects on the cars from a distance. 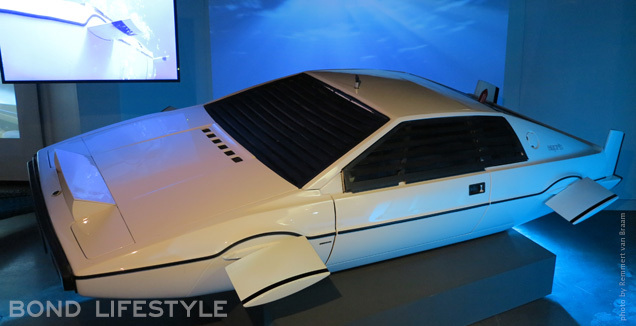 In a blue, always moving room that makes you feel like you are under water, the Lotus Esprit submarine car can be admired from up close. Also be sure to check out the never before shown steering wheel of the Disco Volante from Thunderball. 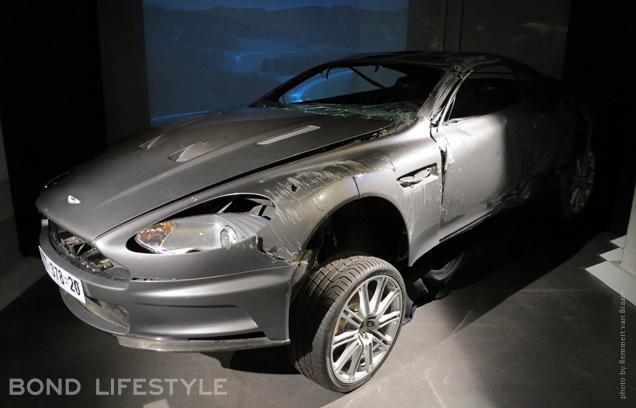 Both a wrecked Aston Martin DBS from Quantum of Solace and a wrecked DBS from Casino Royale are on display next to each other. 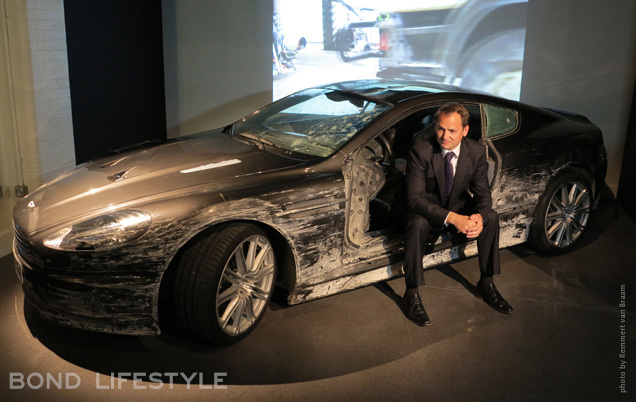 During the press preview of the exhibition, stunt driver Ben Collins (you may know him as Top Gear's racer The Stig) told about his experiences driving the DBS on the roads around Lake Garda for the pre-title sequence in Quantum of Solace. Collins explains that the DBS was a standard DBS with only a modified hand brake and a switch to turn the ABS on or off, both enabling the stunt driver more control and possibility to throw the car around in a spectacular way. It’s not all vehicles and models, but there are a few props on display as well, including Bond’s Tom Ford coat of arms cufflinks and his Evaluation Report, both from SkyFall. 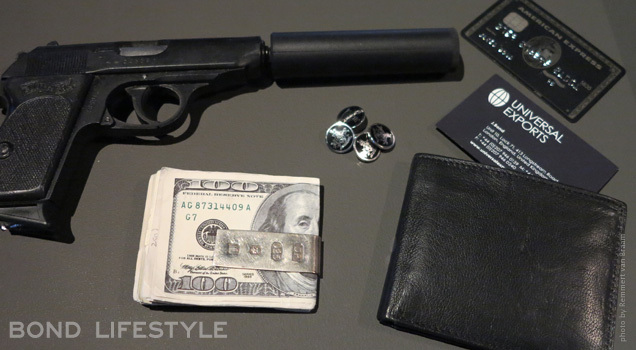 Other props are some personal items from Casino Royale, including Bond’s and ‘Stephanie Broadchest’ (Vesper’s alias) passports, the Douglas Pell moneyclip, Omega watches and the black American Express creditcard. 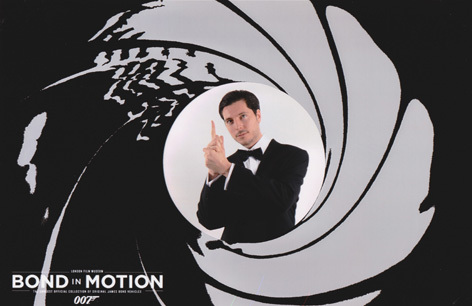 Another cool feature of the museum is a room set up as a studio, where visitors can have their photo taken in Bond style. It will be printed out with the gunbarrel and Bond In Motion logo. At the end of the exhibition there’s a chance to sit down and get a drink and snack in the museum café, while looking at more unique models displayed here, including one of the train from GoldenEye and several helicopters. 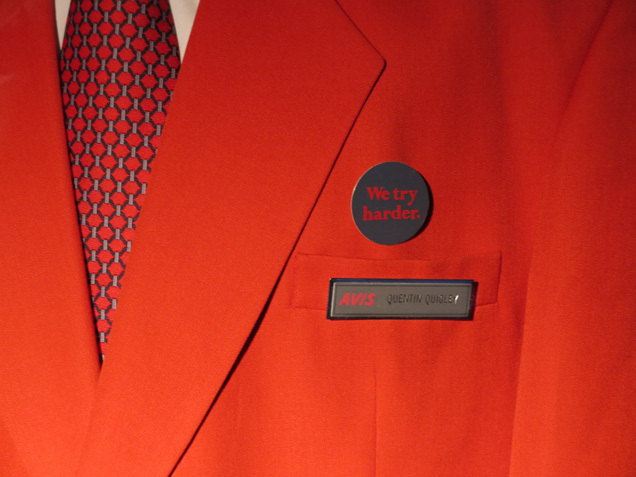 Finally, the most difficult part of all: getting through the gift shop without buying anything. 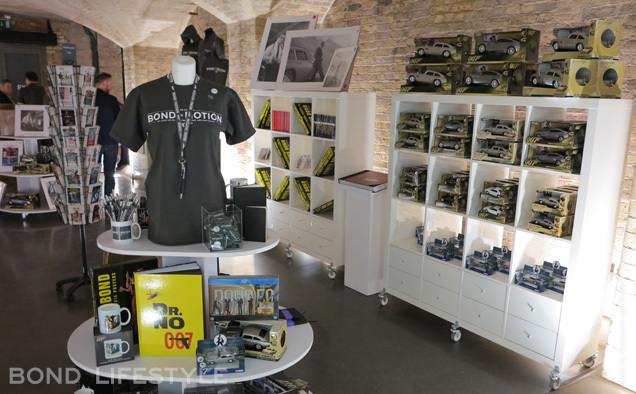 The gift shop is well stocked with all kinds of 007 branded items, from the Toy State car models in all sizes, 007 mugs, posters, books and dvd’s, to Bond In Motion merchandise. Even the most frugal fan might succumb to add something to his or her collection here. If you have a chance to visit the exhibition I would highly recommend it. 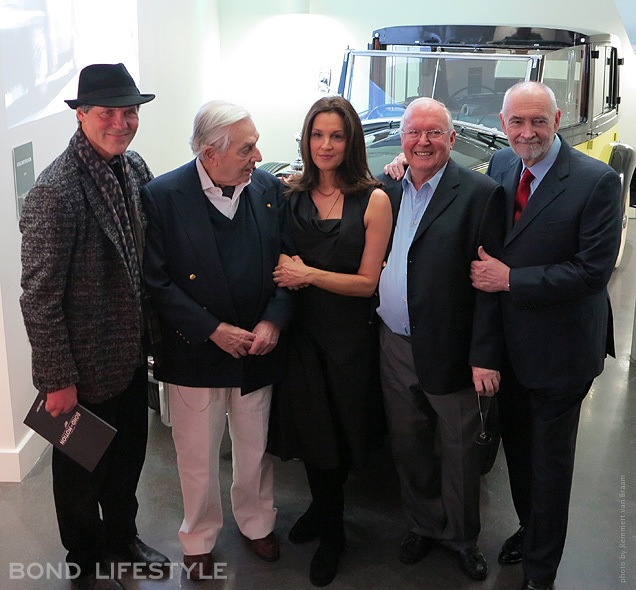 Bond In Motion will run throughout 2014 and maybe longer if it is a success. 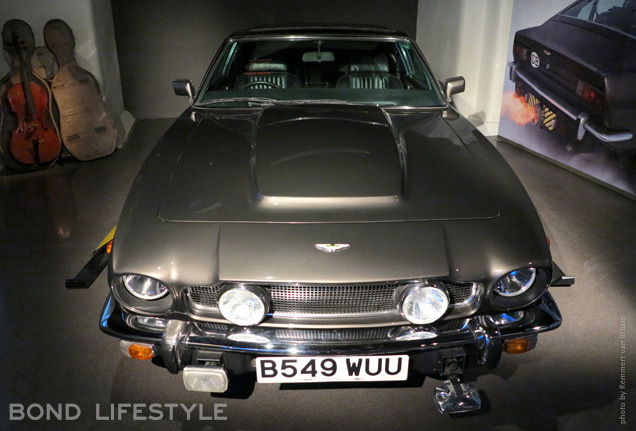 The intimate atmosphere which allows you to get up close and personal with a historic collection of important Bond vehicles, the many detailed models, all displayed in style with posters and projected scenes from the films. Closest Tube stations are Covent Garden and Leicester Square. The exhibition will be open 7 days a week from 10am - 6pm (last entry 5pm), on Saturday from 10am till 7pm (last entry 6pm). The Museum Shop and Cafe is open during museum opening hours. 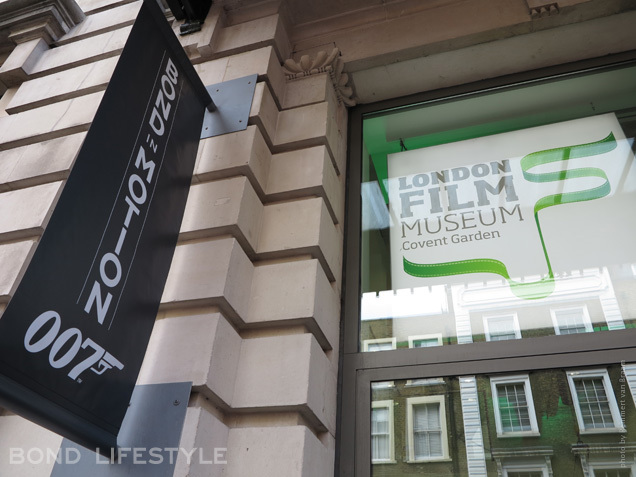 Tickets can be purchased at the venue on the day but to avoid the queues, we recommend purchasing your ticket in advance from www.londonfilmmuseum.com and www.ticketmaster.co.uk, telephone 0207 202 7043. Tickets are priced as follows: adults £14.50; child £9.50, family ticket £38 (2 adults 2 children under 16) and under 5's go free. Please note that photography is allowed, but only without flash. Thanks to Jonathan Sands, Sam Fane, Sal Porter and fellow Bond fans Morten Steingrimsen (Norwegian Bond fan magazine), Adam Bollard (representing From Sweden With Love), Ben Williams (MI6-hq.com / MI6 Confidential) and Mark O'Connell ('Catching Bullets'). Wow! Fantastic! I'm saving for a trip and I know where I want to go to. . . 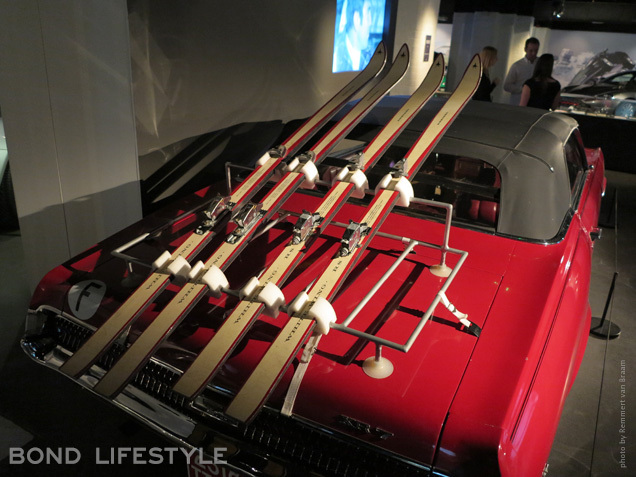 I am a huge Canadian James Bond fan! This exhibition looks amazing !! I really wish I could've seen it! Nice work guys!